The Attorney General works to protect California's workers, legitimate businesses, and taxpayers through the Underground Economy Unit, which is part of the Civil Rights Enforcement Section. The Underground Economy Unit brings civil and criminal actions against persons engaged in the underground economy. The Unit has used California's Unfair Competition law to obtain restitution of unpaid wages, civil penalties, and injunctions to bring businesses into compliance with applicable labor and employment, tax, and licensing laws. The Unit's enforcement efforts are directed at deterring underground economy violations, recapturing lost revenues, and protecting workers and legitimate businesses from illegal and predatory enterprises. It has prosecuted cases involving: wage, tax, and insurance issues including the theft of wages, unpaid overtime, denial of breaks, and misclassification of employees as independent contractors; patterns of safety violations leading to fatal workplace injuries; workers' compensation insurance premium fraud; and the illegal avoidance of workers' compensation coverage for employees. The Underground Economy Unit works closely with other federal, state and local law enforcement agencies including the California Department of Industrial Relations - Division of Labor Standards Enforcement, the Employment Development Department, the Contractors State License Board and the United States Department of Labor. It also coordinates its efforts with other sections of the Attorney General's Office, including those responsible for Consumer Protection and State Licensing. Attorney General Kamala D. Harris and the U.S. Department of Labor’s Wage and Hour Division (WHD) have signed a cooperative agreement to crack down on employer wage theft and other illegal labor practices. The Memorandum of Understanding signed by both agencies will facilitate the sharing of information and enhance enforcement of labor violations. “As host to one of the largest underground economies and immigrant populations in the United States, it makes sense that we begin our quest to combat wage theft. 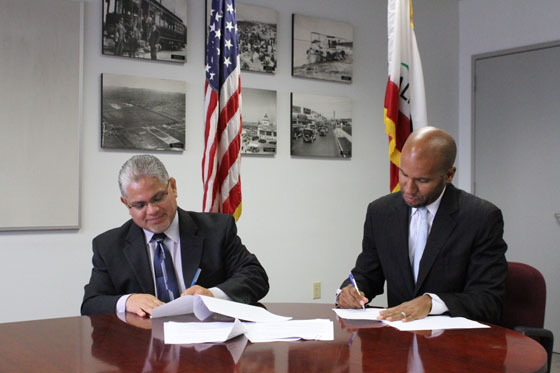 This partnership with the State AG's office is long over due,” said Ruben Rosalez, regional administrator for the western region for the U.S. Department of Labor. The Attorney General’s Underground Economy Unit is dedicated to protecting workers’ rights, bringing civil and criminal actions against persons engaged in the underground economy. The Unit's enforcement efforts are directed at deterring underground economy violations, recapturing lost revenues, and protecting workers and legitimate businesses from illegal and predatory enterprises.